Although it’s only Monday (albeit a bank holiday one – joy to all who don’t have to be at work today), the pamper session that’s planned is top of my priorities. With the weather getting ever so slightly warmer, the focus is more on prep. Making my skin as bright and glowing as possible, as well as my body hydrated ready to get my pins out and attempt some fake tan (more on that soon). Starting with a reasonable recently purchase, the Omorovicza Thermal Cleansing Balm has shot straight to the top of my ultimate pamper treats. It’s looks a little intimidating in the pot, but smooths on melt away makeup, revealing a bright and thoroughly cleansed complexion. After that, I opt for a hydrating yet exfoliating mask in the form of The Body Shop Honey & Oat 3-in-1 Scrub Mask, which smells wonderful for a start. It contains bits of oat that you can work round your face to scrub away any dead skin cells, then the honey gets to work to hydrate your skin, making it plump and smooth. It’s such a fantastic mask for the price and well worth the purchase. Once all the cleansing is complete, it’s time for treatments. Firstly, I’ll apply a facial oil as I use one pretty much every day. Recently, day and night, the Bohdi Neroli Luce Face Oil has been gracing my skin and it’s oh so welcome to do so. It’s such a gorgeous oil that really brightens and hydrates skin, while taking no time at all to sink in meaning you can use it before makeup if desired. I’ve really been enjoying using this over the past few weeks and have noticed a visible difference in my skin from doing so. Facial oils are the key to life, guys. After that’s sunk in a little, I’ll either use more of a moisturiser or another treatment style cream. If I’m using a moisturiser, I’ll go for the RMK Recovery Gel, which is very odd looking (think frog spawn) but smells divine (think citrus) and really leaves skin bright and radiant in the morning. It’s a wonderful product to use and one that has been helping the overall texture of my skin. 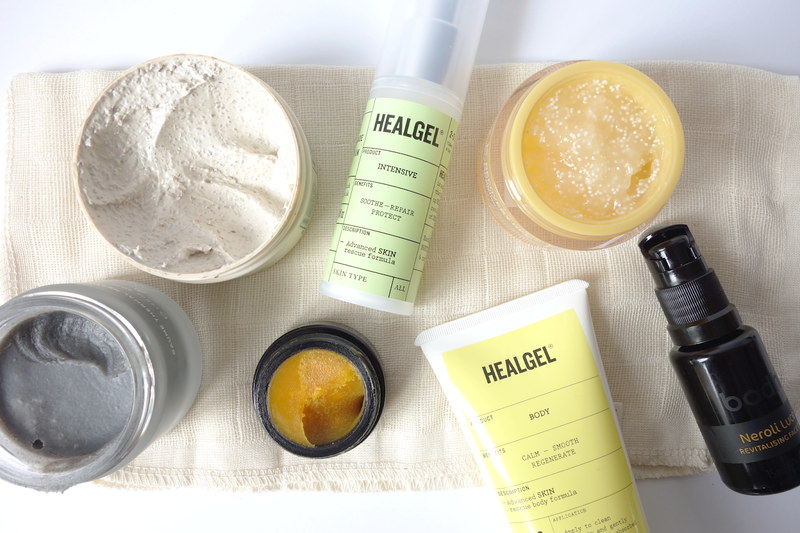 If I want more of a treatment to sort out any other skin issues, I’ll use a product from one of my favourite brands: HealGel Intensive. 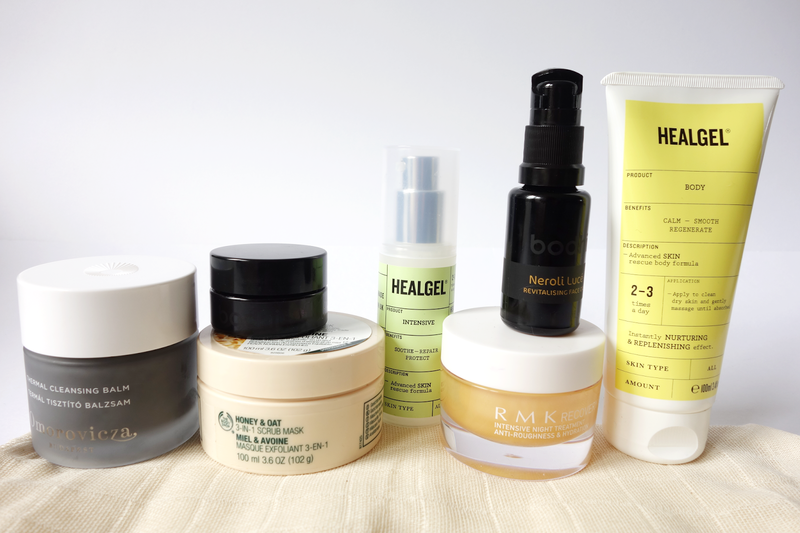 It works to just sort out skin, not a very scientific or in depth description there… But that’s just what it does! A great all round product. Finally, I’ll apply a little Bodhi Cocooning Lip Treatment, which is like a solid balm that melts into an oil-like texture but does wonders for the lips! As someone with permanently chapped lips, I’d recommend it. After that I’ll slap on a decent amount of HealGel Body, a new release from the brand. It’s a great moisturiser that works for hours and hours to hydrate your skin, leaving it soft and supple. Great for those of you with irritated or dry skin, too, as it soothes and restores making it a perfect pamper (or every day) treat. So they’re all the products I’ll be using in this weeks installment of the mid-week pamper. What are you treating yourself to this week? I’d love to know in the comments. ps. Please take a look at my blog sale! It has to end tonight!